Distribution and applications Widespread light, filtered through glass and reflected light on the ceiling. 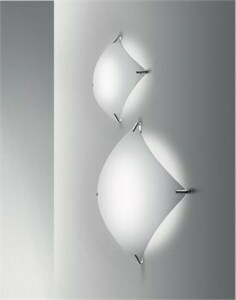 Ideal for general lighting in corridors, halls, bathrooms, show rooms, offices, staircases. Materials Glass diffuser. Glass holders in brass. Finishes and colours Matt white glass. Glass holders in chrome. Mounting Wall and ceiling mount. Suitable for installation on normally inflammable surfaces.